I bought Chivalry Medieval Warfare from the Humble Staff Picks Bundle: Glen. I enjoyed the game and had played a free weekend a while back. I made a Logitech G13 profile for it because that is what I do at this point unless the game works with my xbox 360 controller. The profile works well and is similar to a typical FPS setup for me. There aren’t many unique keys (feitns and dodge seems to be it). 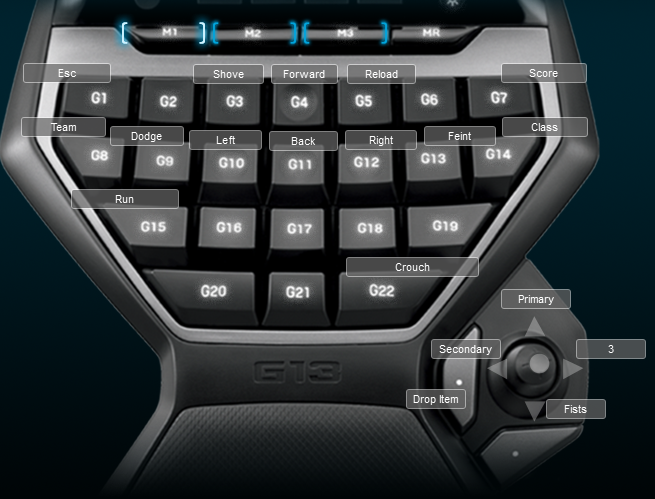 Below is an image of the keyboard layout I use.